The Paasche brand is famous worldwide thanks to the equipment produced for artists, makeup and tattoo artists, and those who want to learn painting. Many people prefer airbrushes and air compressors by Paasche, because of their reliability and durability. It is convenient to assemble the devices, using the instruction manuals, as each item has got a few parts which you have to attach together. Moreover, all the products are easy-to-use and you can find relevant information, regarding them, in manuals or online. No matter what kind of hobby you do, Paasche products are intended for multiple application uses. For instance, if you are engaged in airbrush painting, you may probably need the device that provides steady airflow through the airbrush. 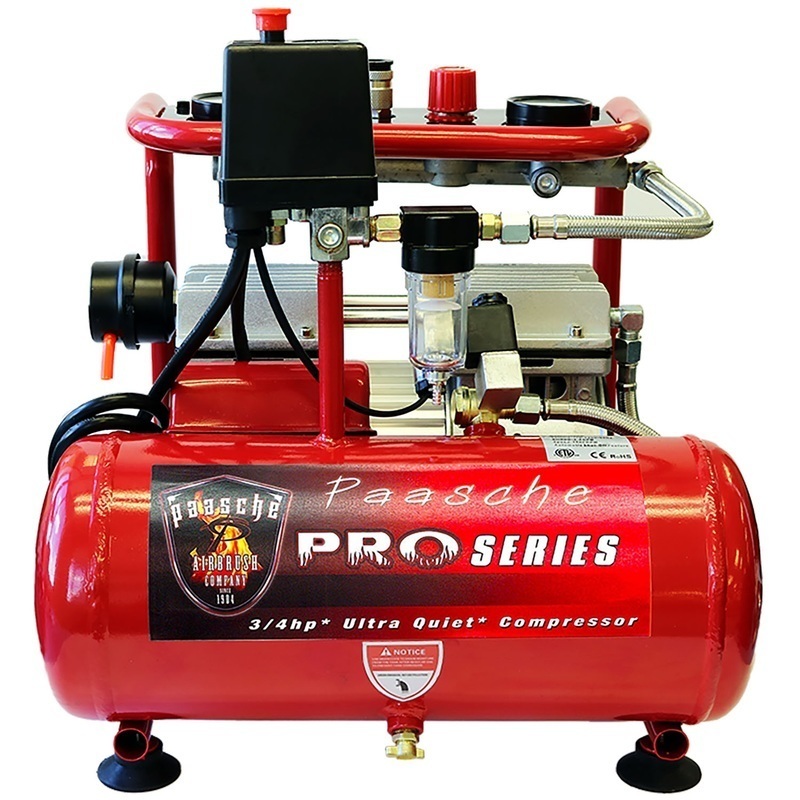 Have a look at the DC850R air compressor which is one of the most versatile and powerful devices among Paasche compressors. To begin with, this item is the perfect choice for any craft like modeling, painting, makeup or food. Besides, you can do several hobbies at the same time as the compressor can run up to 4 airbrushes simultaneously. You can also apply spray guns (for example, LGM-10 or HG-08) for quick spraying. Don’t use any other airbrushes or spray guns, but those mentioned in the instruction. Otherwise, it can cause the damage and early wear of the motor. Apart from that, the compressor is super powerful, providing up to 100 PSI which depends on the airbrush you use. Moreover, the motor delivers steady and smooth airflow for even coverage. Despite the fact that the compressor is efficient, it is surprisingly quiet. The device won’t disturb you and your surrounding while running as it is quieter than a conversation in office or restaurant. As a result, that makes the DC850R item is more silent in comparison to most models. And finally, the compressor comes with a tank, regulator with the moisture trap and two air hookups. With the help of the user manual, you can easily assemble the compressor and enjoy your work. In addition, the package comes with the user manual so you can read and understand basic principles of the compressor work. Also, the instruction contains restrictions and prohibitions concerning the use of the device. However, the DC850R specifications differ this item from other models (see technical characteristics below), making it more powerful and efficient, less noisy and prone to rapid wear. For multiple hose hookups use QM-2/QM-4 manifolds. The HF-592 hose adaptor suits a ⅛” NPT hose fitting, while the HF-116 adaptor matches ⅛” BPS hose fitting. 19" x 17" x 15"